Interferons (IFNs) were the first family of cytokines to be discovered. In 1957 researchers observed that if susceptible animal cells were exposed to a colonizing virus, these cells immediately become resistant to attack by other viruses. This resistance was induced by a substance secreted by virally-infected cells, which was named ‘interferon’ (IFN). Subsequently it has been shown that most species actually produce a whole range of interferons. Discovered over 50 years ago, the interferons (IFNs) were first identified and are historically best known for their ability to elicit viral resistance to cells. On the basis of this criteria the IFNs were initially classified into two types—the type I family composed of the acid-stable forms IFNα and IFNβ, whereas the acid-labile form, IFNγ, was classified as the lone type II IFN. In recent years, a third type of IFN has been described, IFNλ. Originally termed interleukin (IL)- 28a/b and IL-29 these proteins have been re-classified as IFNs based on the similar modes of induction and anti-viral activities they share with the type I and type II IFNs.3 However, although the type I and type III IFNs are induced during a viral infection and are, at least in part, involved in host defense against viruses, the type II IFN is primarily involved in the allergic response, in host defense against intracellular pathogens and in control of tumors. Figure 1. Representation of the distinct receptor systems employed by IFNs for signal transduction. All interferons mediate their biological effect by binding to high-affinity cell surface receptors. Binding is followed by initiation of signal transduction, culminating in an altered level of expression of several IFN-responsive genes. The three IFN types are distinguished by the use of distinctive but related multi-chain cell-surface receptor complexes (see Figure 1). All receptors involved in IFN signal transduction are classified as class II helical cytokine receptors (hCRs) sharing homologous structural folds and basic structural elements with other proteins including tissue factor, and the receptors for IL-10, IL-20 and IL-22. In the extracellular region, all members of this class of hCR have tandem domains consisting of B100 amino acids each housing a type III fibronectin (FBN-III) domain with topology analogous to the immunoglobulin constant domain. With the exception of IFNAR1, which has a four-domain architecture, all other IFN receptors consist of two FBN-III domains. 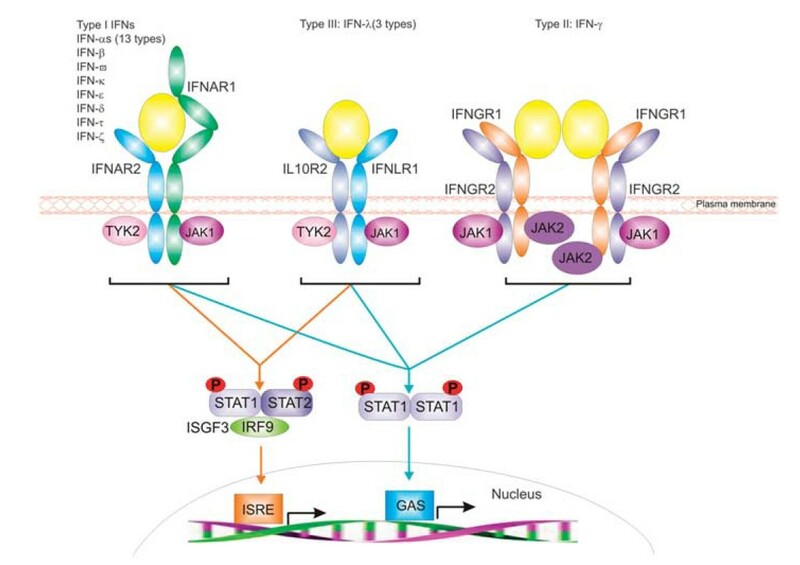 Interestingly, although the receptors are unique to each IFN type, components of each signaling complex, namely IFNAR1, IFNAR2, IFNGR2 and IL10RB. All IFN-stimulated genes are characterized by the upstream presence of an interferon stimulated response element (ISRE). Signal transduction culminates in the binding of specific regulatory factors to the ISRE, which stimulates RNA polymerase II-mediated transcription of the IFN-sensitive genes. The induced gene products then mediate the anti-viral, immunomodulatory and other effects characteristically induced by IFNs. Generally, IFNs are produced by the body to fight infection or in an allergic response. The most pronounced effect of type I IFNs relates to their anti-viral activity, as well as their anti-proliferative effect on various cell types, including certain tumour cell types. Anti-tumour effects are likely due not only to a direct anti-proliferative effect on the tumour cells themselves but also due to the ability of type I IFNs to increase natural killer (NK) cell and T cytotoxic cell activity. These cells can recognize and destroy cancer cells. Of the IFNs, the type I IFNs have the broadest range of biological activities having both protective and counter-protective effects in different immune situations. Although type I IFNs are protective in viral infection, IFNβ signaling causes lethality during certain bacterial infections but protection against certain protozoa and fungi. In contrast to the type I IFNs, IFNγ is induced in NK and NKT cells, CD8 T cells and Th1 CD4 effector T cells, has roles in immunity against viruses, intracellular bacteria and tumors and is generally anti-inflammatory in allergy and asthma.